The snow started falling a couple of days ago and I took some shots on my way home. The light here was strange because there was a demonstration in the background and the bright blue lights of the police vans and the strange reds and greens of the traffic lights splashed a surreal rainbow of colour on the street. 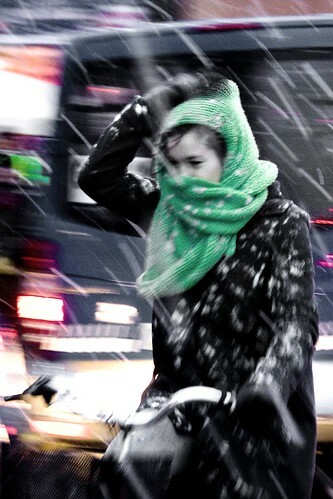 Green scarves shine through, however. 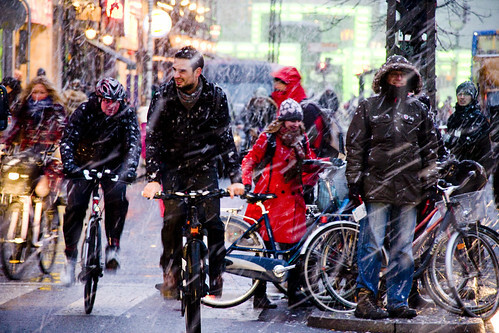 With the Climate Conference in town I've been giving interviews almost constantly and everyone asks about how on earth people continue to cycle in the winter. The temperature has hovered around freezing all week and, with the wind chill, we're pushing -10 Celcius. We just get on with it. We have a closet filled with winter clothes that we can use for walking or cycling and we just get on with it. 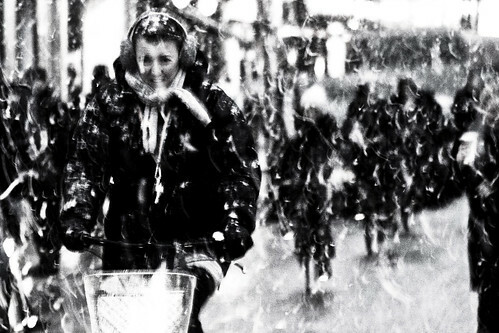 People have been cycling in winter since the bicycle was invented, so why should it be any different now? Bring a friend. It's always cosier. I prefer it at least a bit colder than hovering around freezing. It's still comfortably warm riding weather, but rather drier. hej fra tyskland. sunny, cloudless but cold at the moment. do all those people have changing clothes at work or how do they protect themselves again this wet snow? A change off socks and shoes is a good idea though, but alas I all ways freaking forget. no change of clothes. who needs it? it's just water. 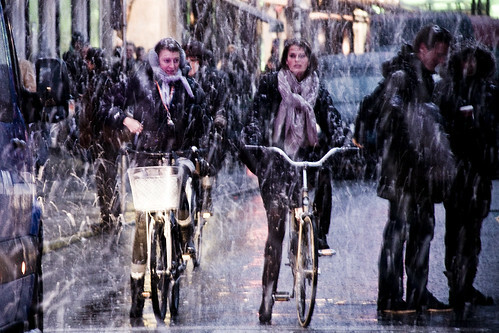 some may have rain gear in their bag, but most people just head on through the snow. I enjoy your blog and I thank you for it. I am struck with the lack of Danes wearing corrective eyeglasses in your photos. Can it be that there is a disproportionately few number of visually challenged Danes or do Danes cycle visually impaired? It is -8C with a windchill of -17 here in Toronto as I write. Merry Christmas wishes and Winter Solstice Greetings to all. Funny, today I didn't ride my bike to work because it was super hot. Which doesn't happen very often but I could feel the sun really biting my skin. Dealing with cold's easy, you just put clothes on. That snow is still pretty light -- and it appears to be melting pretty fast. I've been really lucky because it's half way through december and I'm still riding my road bike; once the snow lays in (Toronto, Canada) I'll have to switch to my hybrid with chunky tyres. I was riding the other day in -21C, (although i did wear goggles, it was a bit to much) Also rode thru 10cm of fresh still falling powder. It is a strange and beautiful feeling to travel around a small town with no sound, but the crunching of snow on the tires. It brings a peace to me. 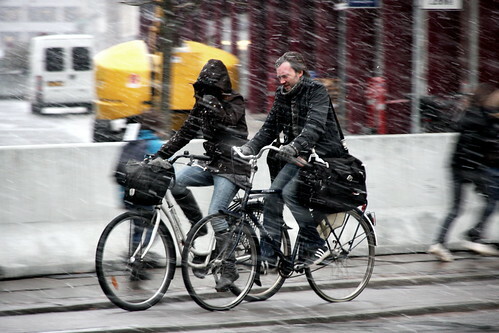 You Copenhageners are not the only ones who cycle in winter, Here in Helsinki it was -15c yesterday and -10 today ( + windchill). But what comes to clothing I have to say, that if I ride 12 km to work in my normal clothes (jeans and wool coat), I feel sweaty, cold and uncomfortable at the same time. So, I have to wear technical underwear and some kind of waterproof and breathable cycling clothes as outer layer. Maybe in shorter, few kilometer rides so called normal clothes are ok, but for longer rides I'll choose more suitable clothes. And that leads us to the question, that I've been wondering: what is the length of the average commute ride in Copenhagen? Is there a statistics of that? i love the snow! we've been getting the ugly pellet shaped stuff here.. but the fluffy white stuff seems to have gone to copenhagen for the conference..
thanks for hosting the world..